Trauma and loss collide in episodes of mass violence. Emotional wreckage for the loved ones of those lost, heartbreak for the first responders, and gaping wounds in communities converge to create a phenomenon distinct from other losses. The tears still come when Celeste Peterson looks back—and even when she doesn’t—to the day six years ago when her daughter was killed in the nation’s deadliest school shooting: the massacre at Virginia Tech. A former high school varsity basketball player and team captain, 18-year-old Erin Peterson was a daddy’s girl and the light of her mother’s life. The afternoon of April 16, 2007, was like any other. An only child, the freshman international studies major had gone to French class, where she and most of the other 32 victims were murdered by student Seung-Hui Cho, while many more were injured. In an instant, countless lives were affected by one man’s actions. But there is healing—and healing again after wounds reopen—as they often do for the loved ones of the victims of mass violence. 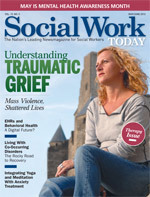 Social workers can play a significant role in facilitating that healing, whether on the scene after an event as members of highly trained crisis intervention teams or, more often, months and even years after the events when trauma lingers or the lives of people who thought they had moved forward begin to unravel. Providing information and helping refer people to counseling services and bereavement support groups are among the ways social workers can assist following mass violence, says Nancy Boyd Webb, DSW, BCD, RPT-S, the distinguished professor of social work emerita at Fordham University Graduate School of Social Work in New York. She adds that in situations involving children, social workers can educate parents and teachers about children’s typical responses after traumatic events. In the immediate aftermath, there may be a temptation for local social workers to offer help and support, but crisis management on the front lines and in the first hours and days after a tragedy is a task that should be reserved for clinicians specially trained in traumatology, according to Tecala. Even those with advanced training can be swamped and overcome by the intensity of tragic events, stresses Tecala, who operates the Center for Loss and Grief in Washington, DC. “When 26 people are killed and 20 are children, for example, it is overwhelming, and whenever children are involved it’s always harder for first responders.” She recommends alternating days of service with days for respite. She says it’s crucial because when you overwhelm your psyche, you can’t help others. Experts agree that the key to helping the loved ones of victims of mass violence is to understand the unique qualities of traumatic grief. In more typical circumstances, a death may be seen as a natural event, and there may be time to anticipate grief and say good-bye. Mass shootings or other mass violence, in contrast, cause sudden, shocking loss. Survivors and family members, who are sometimes neighbors or fellow community members, often mourn the loss of multiple victims and engage with others similarly bereft, becoming engulfed by tragedy. Grieving for these unimaginable losses is different, compounded, and complicated. Curt Drennen, PsyD, RN, a clinical psychologist and manager of Disaster Behavioral Health Services, Office of Emergency Preparedness and Response, Colorado Department of Public Health and Environment, defines normal grieving as a process, recreating the cognitive schema around the meaning of life, the relationships in life, and the expectations associated with those relationships. Part of the grieving process involves restructuring a life without the deceased. But after mass violence, Drennen says, “when someone you love goes to the theater or to school expecting a normal situation and that normalcy is shattered by violence that takes life, there’s the additional impact of the scene of an intentional event in which a perpetrator purposely set out to cause pain, suffering, and harm.” Following such a traumatic event, you also have to restructure how you perceive the world and your expectation of safety, he adds. The Petersons, for example, learned about the Virginia Tech shooting at 9:26 am on April 16. It wasn’t until the next morning, after an agonizing night, that they learned the cruel fact that their daughter was among the casualties. These circumstances form “a constellation of high-risk factors that will catapult a family not only into having to deal with grief but also with trauma,” says Therese Rando, PhD, BCETS, BCBT, a clinical psychologist, thanatologist, and traumatologist and the author of numerous books on bereavement. The critical part is the interaction between trauma and loss. Recognizing the effect of that interplay and the reverberations it creates is the job of any social worker working with the families after mass violence. “You have to deal with the demands of trauma and trauma mastery, and deal with the loss and the accommodation of grief and mourning, and also look at the way they influence each other,” Rando explains. One way this interplay complicates bereavement is that the strategies for coping with trauma often are at odds with those for coping with grief and vice versa, according to Rando. In normal grieving, for example, the bereaved want to recollect and reminisce about their loved ones, but thinking about the person may be exactly the thing that families traumatized by a shooting death need to not do. “Every time they think about that person, they might have an image or a kind of sensory reaction. If they’d been in the area and smelled the ammunition or heard the cries, for example, those sensory reactions could overcome them so that they end up stifling the grief,” Rando says. They don’t want to go there in their minds, to remember, she explains, because every time they do, they have horrific images or think about the agony or fear their family members experienced. The reminiscing that’s so important in grief work may “end up causing more distress and make them more vulnerable and more able to be revictimized,” she says. In traumatic deaths, the details of the trauma predominate initially, Rando says, and these preoccupations can interfere with the normal grieving process that involves remembering the deceased. Clinicians can’t simply deal with the trauma piece and then deal with the loss piece and be done, she adds. Drennen says a first step is to determine how long it’s been since the traumatic event occurred, where individuals are in the grieving process, and whether they’re ready to talk. In the first few days, and perhaps for much longer, the individuals’ brains are trying to process the information at the same time they’re trying to protect themselves from the suddenness of the trauma, Tecala explains. “Sometimes people seem to deny, to be in a daze, but these are all coping mechanisms,” she adds. According to Drennen, “When there are people we can connect with as clinicians who have experienced such a public trauma, we can put the blinders on and feel such an impulse to help this person that we forget the need to take it slowly, to allow the individual to dictate what the need is, to really listen and allow them to articulate what their struggles are.” He adds that it’s also important for clinicians not to assume to know what the struggles are because every person’s needs can be different than what you expect they may be. It’s then that mental health professionals must be particularly vigilant to the needs of their clients, for whom the reality of the situation is beginning to sink in. Look for symptoms that get in the way with functioning, Tecala says, such as signs of insomnia or sleep disturbances, anxiety, forgetfulness, poor concentration, or loss of appetite. Also be alert for signs of complicated grief in people months and even years after a traumatic event, Rando advises. For example, consider the person who has lost interest in normal activities or who is going through a divorce. Mourners can feel defeated or abnormal if they don’t accommodate the loss on the schedule or in the manner others seem to think appropriate. “Clinicians should emphasize that different people will express their feelings differently, and that there is no one right way to grieve,” Webb says. Clients can be encouraged to tune out messages from experts or well-meaning friends who suggest that they must mourn in a certain way or for a certain time. According to Tecala, individuals often experience secondary grief when they have unresolved grief in their lives. When something, such as news reports of mass shootings, triggers those feelings, they experience real grief, even if they don’t know the victims. And for those who have experienced traumatic grief in the past, new tragedies can open old wounds. Tecala recalls, for example, a patient whose son was killed in the World Trade Center. For the first year, every time she saw news reports about people who died—deaths not in any way connected to 9/11, she’d cry. “She wasn’t crying for those people,” Tecala says. “She was crying for her son.” Clinicians can help these individuals by suggesting that they limit how much time they spend watching television and avoid the continual media replay of traumatic events that can hinder healing. Be mindful as well of the effect of media coverage on those directly affected by the traumatic event. “Grief is on display in public and private settings. Most often, the grieving are in a fog mentally and physically,” says Figley, who also is the director of the Traumatology Institute at Tulane University. “Public support breaks through the fog because it shifts the grieving from someone who lost so much to someone with the responsibility of expressing this to others. Often, they run out of others to process their grief. Community outpouring is a wonderful distraction as well as a reminder of their importance to the community,” he adds. — Kate Jackson is an editor and freelance writer based in Milford, PA. She has written for Social Work Today on topics such as grief and loss, mental health, compassion fatigue, and the emotional aspects of illness.